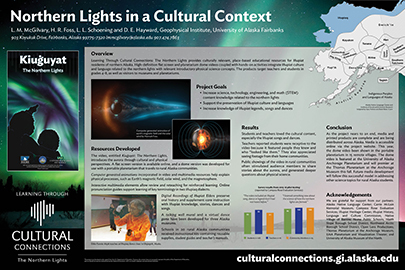 Learning Through Cultural Connections: The Northern Lights weaves together science concepts about the aurora borealis with Iñupiat culture and language. The project includes three key products: classroom instruction kits, interactive museum exhibits and a 25-minute video, “Kiuġuyat: The Northern Lights.” The film also was produced in a format for high-definition viewing in a planetarium. The Learning Through Cultural Connections products are the culmination of a three-year, $1.4 million grant project funded by the U.S. Department of Education. 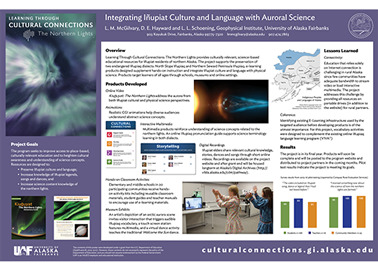 The curricular materials included in the instruction kits and the video were developed for elementary and middle schools in Iñupiaq-speaking areas of northern and western Alaska, but are available online for teachers anywhere. 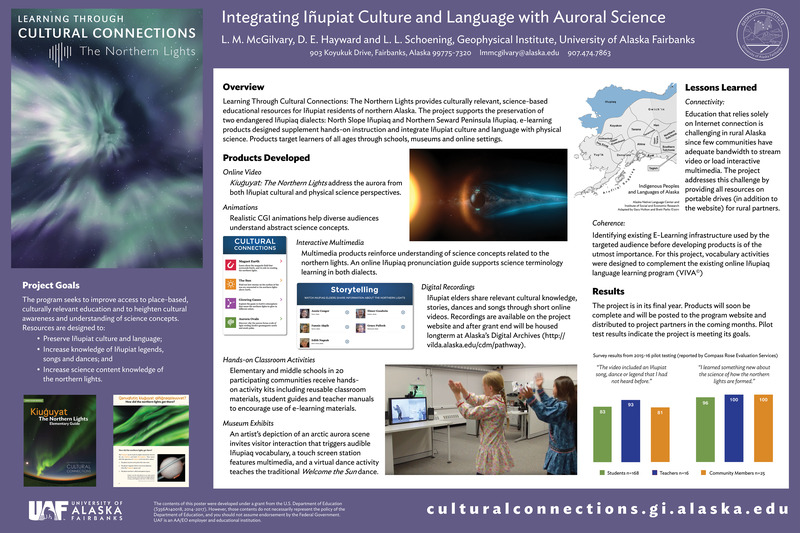 The curriculum was created by staff in the outreach office at the University of Alaska Fairbanks Geophysical Institute (GI), reviewed by Iñupiaq educators and knowledge bearers as well as scientists, and pilot-tested by teachers in partner school districts. The curriculum is aligned with Next Generation Science Standards, Alaska Science Standards, Alaska Cultural Standards, the Iñupiat Learning Framework, Iñupiaq Cultural Values and Alaska English/Language Arts Standards. "What better hook to draw people into science and into Iñupiat culture than the aurora?" GI Communications Director and project Principal Investigator Lynda McGilvary said. "We've created something that a teacher unfamiliar with Alaska Native culture can use in mainstream, core instruction in the classroom. We've given them a pathway to a discussion about the local culture. The teacher can incorporate traditional forms of communication — storytelling, dancing and songs that the students have heard since they were too young to speak. This all now has relevance to what they're doing in school" in their science classes, McGilvary said. Kits containing the elements of the curriculum, including materials such as teacher and student guides, vocabulary cards with relevant science terminology in English and Iñupiaq, and supplies needed to complete hands-on lessons were distributed in January 2017 to every elementary and middle school in the North Slope and Northwest Arctic Borough School Districts, as well as to Nome Public Schools, which was 23 schools in 20 communities. As part of the grant, staff from the GI will be taking a portable planetarium to the 20+ communities to share “Kiuguyat: The Northern Lights” with students and community members. The planetarium version of the film made its rural debut in Shungnak, Alaska in 2016, and its urban debut in Anchorage in 2017 at the University of Alaska Anchorage Planetarium. Interactive museum exhibits installed at three museums by grant end will expand the reach of the materials. Partners supporting this project include the three school districts as well as the Native Village of Barrow, Iñupiat History, Language and Culture Commission, Alaska Native Language Center, Iñupiat History, Language and Culture Center, Carrie M. McLain Memorial Museum and UA Museum of the North.